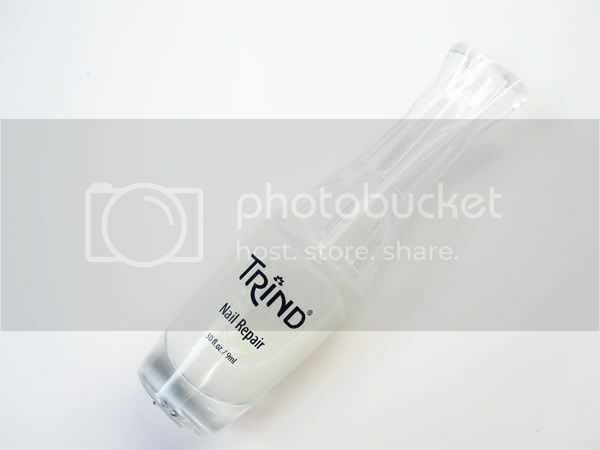 For the last three weeks, I have been putting this bottle of Trind Nail Repair to the test. I received it a Carmine box months back, but didn't feel compelled to try it out straight away due to using up an OPI Nail Envy mini (my review). The Trind Nail Repair comes in several different types and I received the 'natural' one which sets to a clean and clear finish. The bottle design is great and the brush is good. Application is a little time consuming though. Unlike OPI's Nail Envy where you apply a coat over a coat every other day and then remove everything after a week, Trind's Nail Repair forces you to apply a coat a day, but to remove the last day's coat FIRST, with an acetone based nail polish remover. This apparently allows your nails to 'breathe' and accelerates the nail repair process. The first week of using this, I noticed some excellent results, especially after Day 4. My nails felt tough and didn't split or break. But when the second week set in, I noticed that my nails began to split at the edges like they usually do. However, this only started to occur when my nails grew over the tips of my fingers, but this generally happens to me anyway which is why I keep my nails mostly short. In comparison with OPI's Nail Envy, I would say that the results were pretty much the same. Both helped to strenghten my nails for about a week, but prolonged use caused them to split as they usually do when they grow too long. The main difference I saw between Trind and OPI, is that OPI's Nail Envy is a lot more fuss-free application wise and gives a much more tougher, plastic-feel to nails, whereas I didn't notice this with Trind, it just looked like I was wearing a thin clear nail polish. Summary: If I had to choose one to recommend, I'd say go for OPI Nail Envy, though I will personally probably be on the hunt for one that is formaldehyde free. Do you use any nail repair/strengthener products? I thought using an acetone every day to remove the previous coat was kinda of a contradiction... surely, that can't be good for nails... I liked that it leaves a really shiny finish so I think I'll use it as a top coat. yes i thought that too! i almost always use an acetone free nail polish remover but had to borrow a friends acetone one for this because the free version wouldn't completely remove it. it's odd because acetone generally DESTROYS natural nails! I might use this up as a top coat too. Thanks for this review, I will also check out your OPI review! my nails seem to split when they start to grow! Hi, I am long user of TRIND Products the full range The Perfect System is there to balance, our natural nails all the components work together to achieve long lasting benefits. But they all have to be used together to achieve this. I was a nail bitter for many years and now have flexible, long nails and healthy. I really recommend these products.